There’s a little kid inside of me that cannot resist donning a disguise of some sort when Halloween comes around. 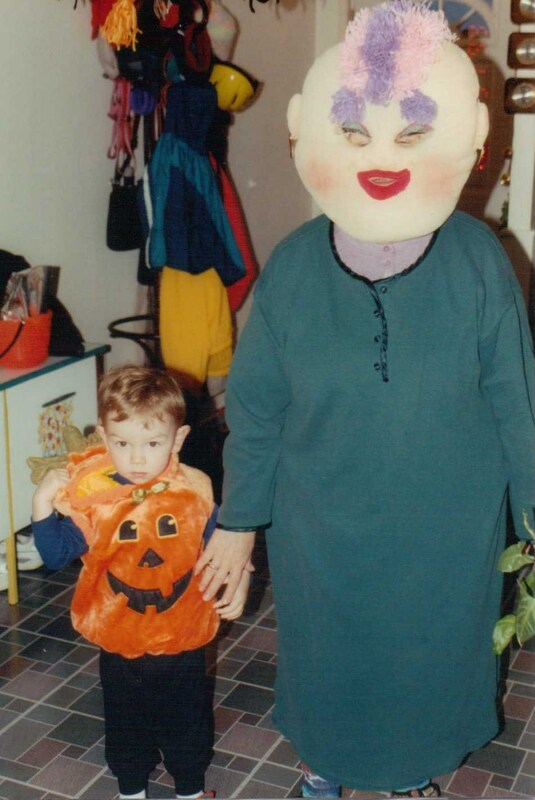 When my children were small, I dressed up with them and went door to door. Then I had grandchildren, and I dressed up and went door to door. Then the grandkids grew up and no longer wanted to go out with grandma. But I found a way to dress up—celebrate. Not only get in disguise, I inspired others to follow suit. Caption: I will not forget this. Someday I will get even, Grandma. My aquatic aerobic class participants from La Grande, Oregon—ah, my lovely water lilies. I’m the one in the middle with the purple, pink and green jelly thingies encircling the crown of my head and the white stuff around my eyes. And of course, my mouth is open. I loved instructing those ladies. We also donned fancy, decorative Easter Bonnets at Easter, and made firecracker hats for The Fourth of July. Back then, three years ago, I weighed a hefty two hundred and four pounds. I’ve since lost eighty-five pounds and stopped coloring my hair. I go to the pool here in Central Oregon every day and Halloween is coming up. I’ve started looking around for inspiration.